Charlotte Bronte was born on April 21st 1816 at Thornton, Bradford in Yorkshire, third child of the six Bronte children. In 1821 her mother dies of cancer. In 1824 she attended the newly opened Clergy Daughters' School at Cowan Bridge. While there with her sisters Maria, Elizabeth and Emily they suffer the harsh regime, cold and poor food. In June 1825 Charlotte and her sisters were finally taken away from the school for good. Her two eldest sisters, Maria and Elizabeth died of consumption; the poor conditions while at the school were largely to blame. The experience of Cowan Bridge and the loss of her sisters had an affect on Charlotte. In 1829 Charlotte begins to write stories: The Search After Happiness, History of the Year, are some of the titles. She also works on stories with Branwell, such as the Angrian and Glasstown sagas. In January 1831 she enrolled at Roe Head where she met Ellen Nussey who becomes a life-long friend. In June 1832 she completed her education at Roe Head and in July 1835 returned as a teacher. She resigned in May 1838 and returned to Haworth. In February 1842 Charlotte and Emily left Haworth for the Pensionnat Heger at Brussels. While there they learnt French, German and Music. In January 1843 Charlotte returned to Brussels to teach English. In January 1844 Charlotte left Brussels returning to Haworth. An unsuccessful attempt is made to start a school. In May 1846 under the Pseudonym of Currer Ellis and Acton Bell, a book of Poems was published, Charlotte contributed 19 poems. She tries to have her novel the Professor published without success. In August she began to write the novel Jane Eyre. October 1847 Jane Eyre is published and quickly becomes a bestseller. October 1849 Shirley is published, January 1853 Villette is published. June 29th 1854 Charlotte Bronte marries A.B Nicholls; certificate here... March 31st 1855 Charlotte Bronte dies. April 4th 1855 Charlotte Bronte is laid to rest in the family vault at Haworth church. In March 1857 "The Life of Charlotte Bronte" by Elizabeth Gaskell is published. 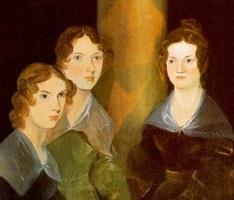 In June Charlotte Bronte's novel Shirley is published.